Mobile couponing has been growing as way for retailers to offer convenient savings for their customer base. Rather than haul a pile of coupons to the store, you just load up a text message or email or whatever and scan at checkout. This also allows retailers to track coupon usage, as you can send custom codes to specific customers and see which ones work and which don’t. Unfortunately, laser barcode scanners can’t read barcodes on LCD screens. They calculate barcode data based on the laser light reflected back and all they really get back from a glass screen is reflection. Mobeam is trying to remedy this and have a solution that will be in the Samsung Galaxy S 4, according to Engadget. Their technology has to be baked into the phone, and when it’s time to scan, the phone flashes light in a certain pattern that tricks the scanner into treating is as reflected barcode data. This technology would’ve been terrific 5 or 6 years ago, but linear imager technology has advanced to the point that a scanner such as the Honeywell Hyperion 1300g or Motorola LI4278 can read off LCD screens without much trouble. There’s also the problem that phone manufacturers have to opt in to add this functionality, and customers have to buy compatible phones. I’m not sure if they’re going to hit critical mass with one Android phone supporting their technology. The migration to imaging technology in data capture seems inevitable at this point. Even those big grocery scales are getting updated to support imaging in one or both scanning planes, such as the Honeywell Stratos 2700 and Motorola MP6000. I could see this being a viable technology for low-resolution feature phones, since they’d have trouble displaying the barcode properly. And I guess for retailers who don’t feel ready to move to imagers it’s a smart choice. But at the point almost every major retailer with in-counter laser scanning also has an imager, either 1D or 2D, hanging out as an alternative. 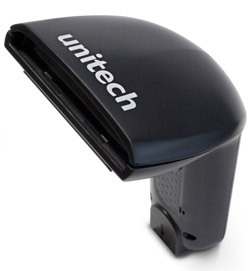 Unitech has a new barcode scanner available, the AS10. The AS10 is a contact barcode scanner, so you end up getting a scan range of up to 2 inches for most barcodes. Its shallower depth of field means the AS10 takes a bit longer to set up for a successful scan than higher end scanners. The scanner’s a great choice for places where you might not scan a lot of products, or you’re not too worried about lines forming waiting to check out. So libraries, smaller boutiques, or maybe even asset management at home or your office. Knowing who has your DVDs is great when you’ve switched to Netflix. The AS10 does not have an autosense or presentation stand available, so it’s all handheld scanning, all day. It’s built to survive 3 foot drops, so knocking it off a counter is no big deal. You get a 1 year warranty with the scanner, so you have some coverage for potential mishaps. We also have a video covering the AS10, so you can actually see it actually scan barcodes. Which is terrific. Terrific. Like the video said, this scanner comes in under $50, so it’s an attractive option for those wanting to streamline data capture but maybe don’t want to break the bank on an expensive retail or 2D scanner.